GQA Qualifications: Total Support Training lives up to its name again. Total Support Training lives up to its name again. 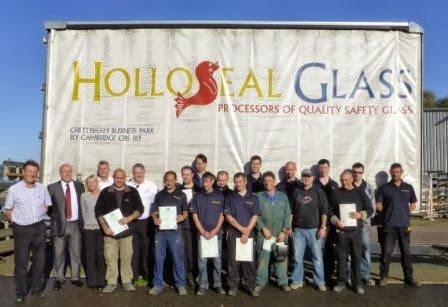 Total Support Training based in Southall has been working with Holloseal Windows in Cambridgeshire for the last 12-18 months and 29 of the employees recently completed the GQA Level 2 Certificate in Glass Processing QCF qualification and the GQA Level 2 Certificate in Glass Related Operations. Along with these, they also completed their Functional Skills qualifications making up the full Level 2 Apprenticeship. Sean Hayes from GQA attended a presentation at Holloseal on the 17th October where a number of achievers were presented with their certificates. Present from Total Support were Sharon Alderton (Centre Coordinator and IV), Keith Bear (Assessor and IV) , Bob Gardiner (Assessor) and Brian Mustill (Operations). The picture shows a number of achievers shortly after being presented with their Certificates. Others were not on the picture due to holidays or shift patterns.